Plus Our 5,000 Facebook Fan Celebration! Welcome to our our Summer 2013 edition of Cloth Diaper Column! This month, we're excited to be celebrating a huge milestone with you! It's hard to believe we've reached 5,000 Facebook fans, and to show our appreciation for all your love, we're offering a giveaway of a collection of our favorite diapers and accessories! Up this month, we're talking about unique and creative baby gift ideas! Plus, we've got other news, new articles, and more! "Summer: If you're not barefoot, you're over-dressed!" I hope you're enjoying your summer! July has raced by in our household. We've had picnics in the "tree house" (our backyard play structure), trips to the beach and the local ice cream shop, and a visit to Lake Erie. August promises to be just as busy, but I'm hoping to fit in a few relaxing days of holidays too. I hope you are enjoying a fun and easy-going summer, too! 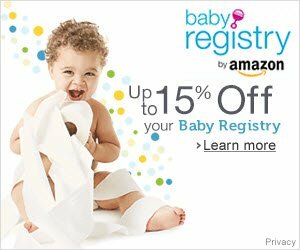 With all the latest gadgets and gizmos, going to buy a baby gift at Babies R Us can feel overwhelming... and impersonal. Looking for something a little different? Get out of the baby gift rut with our list of 20 unique baby gifts, which is sure to get your creativity flowing! Handmade blankets, crocheted hats, monogrammed items, and other keepsakes are always cherished gifts. If you can make something yourself, that's awesome. If not, Etsy can be a great place to find a unique, one-of-a-kind gift that will be treasured for years to come. Start baby's library! Bundle up a few popular board books in a gift basket, or ask every baby shower guest to bring a baby board book instead of a card! 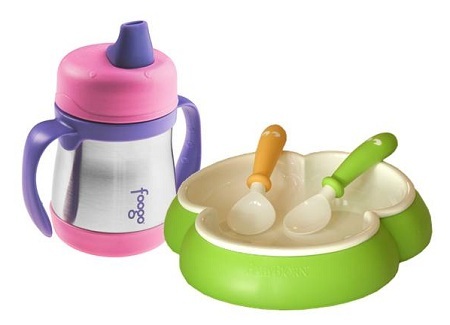 Think longer term - sippy cups, feeding and snacking accessories, and other items will get used for a couple of years, even though they won't be needed for the first few months. Bath toys are another great gift. 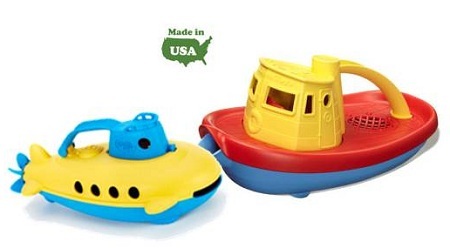 Since these often get chewed on and are exposed to various temperatures, be sure to buy non-toxic toys that are BPA-free, like Green Toys' Boat and Submarines from NatureBumz. Safety is always in style! First aid kits, digital thermometers, and other first aid gear can be a wonderful gift. Ditto for baby gates, latches, and other safety gear that Mom and Dad may not yet have considered, but which will be needed soon enough! Parents always love to receive items they wouldn't splurge on themselves. If you know that they are humming and hawing about a particular baby carrier or monitor, it might make the perfect gift. Sophie the Giraffe teethers, Aiden and Anais swaddle blankets, and other premium items also make great gifts! 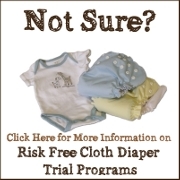 Many parents who want to use cloth diapers hesitate to purchase a newborn set. If they are definitely interested in starting out with cloth, a newborn diaper rental or a few weeks of diaper service can be a great way to ease them into when one-size diapers will fit! Bigger gifts are always appreciated. If you can pool resources with other friends, co-workers, or Family, you can often purchase a car seat, stroller, bassinet, Pack n Play, or other big-ticket item. Alternatively, putting the money on a gift card can give Mommy and Daddy a chance to choose the item themselves, but be sure to check that the store you purchase the gift-card from carries brands that they are considering! For anyone creative, a diaper cake is a great idea. Pinterest is full of diaper cake ideas (motorcycles, cars, tractors, cakes, you name it!) Or consider the more affordable "3 peas in a pod" with 3 cloth diapers in a receiving blanket. You can even look ideas on how to make lattes, milk shakes, and sundaes out of blankets, baby clothing, and cute packaging! If you'd like to make nursery decor, consider creating a wooden growth chart. You can find free patterns and ideas on the Internet, and these are a great keepsake as baby grows. Wet bags are a favorite gift of mine. Perfect for storing wet or dirty clothes, diapers, and other gear, they also go to the beach and other family outings. How about new pajamas for the hospital? I've seen free tutorials on Pinterest to make a (much nicer) hospital robe, or you can purchase sets from Etsy or your regular department stores. Keep in mind - if Mommy's planning to breast-feed, easy access tops are a must! 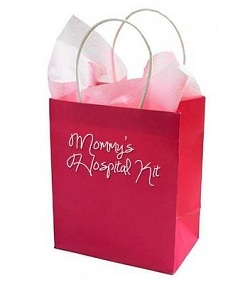 Pack a gift bag to go with Mommy to the hospital. Be creative... consider including items like hair elastics, a fun magazine, snacks or drinks, Advil, and other things you know your friend would like. Services such as prenatal massages, house cleaning, babysitting, or a newborn photo shoot are always welcome and appreciated. And don't forget Daddy... Create a New Parents' Survival Basket. Fill a gift bag or basket with those essentials they may need but haven't thought of yet! Think of fun and humorous ideas like a new CD or movie, snacks, hand sanitizer, clothes pins and rubber gloves, and more. Freezer meals - the first few weeks after a new baby arrives can get downright hectic. Being able to pull a home-cooked meal together with no more effort than defrosting and reheating can be a life-saver, especially for parents that already have other children at home! The same goes for snacks! Putting together a gift basket of healthy snacks, or filling up a few freezer containers with home-made cookies can make late-night nursing sessions and unexpected company a lot more manageable. A subscription to a parenting magazine is a gift that keeps on giving. 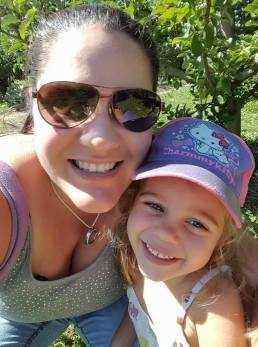 Eco-Parent, Canadian Family (Canada) or Parenting (US) are some good ones. Everyone knows that during pregnancy, lots of items are off-limits. 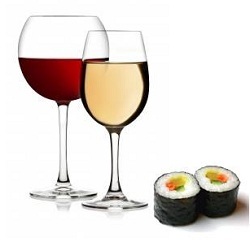 If your friends are wine connoisseurs or have been craving sushi for months, a thoughtful gift or gift-card might be a huge hit! The new parents and baby will all appreciate the time and thoughtfulness that you put into a creative baby gift. ...and now for a giveaway! This month, we're celebrating a huge milestone on Facebook! Thanks to the support of all of our wonderful readers, we've got a great community of cloth-diaper enthusiasts - and we've received more than 5,000 likes! Thank-you for every bit of support! Your encouragement, suggestions and advice on Facebook make a huge difference to those who are just getting started with Facebook. And we love all of you that click through to our articles, subscribe to our RSS feed, follow us on Facebook, and sign up for our monthly and weekly emails! 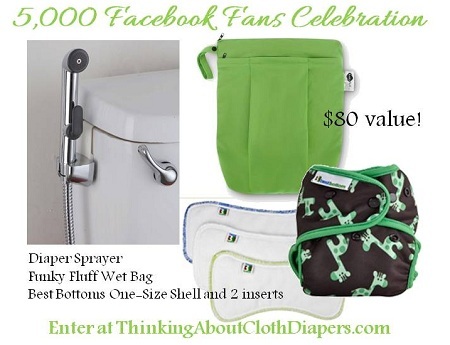 So, in celebration of 5,000 fans and growing every day, I'm offering a package of some of my favorite cloth diaper products: a diaper sprayer, a Funky Fluff wet bag, and a Best Bottoms shell with 2 stay-dry inserts (in winner's choice of size)! The prize pack is valued at approximately $80! Diaper Bag Checklist: What Should You Pack? Sewing Cloth Diapers: e-Book Review and Giveaway - don't miss your chance to win this awesome e-book! Tots Bots just released adorable striped versions of their popular Bamboozle Stretch diapers. It's a tough call, but I think my favorite is the one called Sunset. Which one do you like? You can check them out at Dearest Diapers. Stock up for next year! Cloth Diaper Outlet made a special purchase of Bummis Swimmis. They're currently available for $5 off - now just $8.95 each! Coming Soon: Watch our website for a special event launching in September - our second annual Choose Your Charity Event! Last year, we gave away over $300 to cloth diaper charities, and this year's event promises to be big! If you run your own family-friendly business or know someone that does, it's not too late to participate in this event as a sponsor. Don't hesitate to contact me if you're interested in finding out more! Two big sales you won't want to miss! For Canadians, Nature Bumz has the always-popular one-size Charlie Banana pocket diapers on for $15.95 each - that's $6 off. Like these? You can subscribe to our weekly cloth diaper sales round-up to get deals just like this one delivered to your in-box every week (just click on the weekly round-up link above and then fill out the sign-up form at bottom of the article). With back-to-school only a month away, we're starting our preparation and organization! We've tried alternate labeling options, but nothing compares to how Mabel's Labels hold up over time. I love these little stickers! Whether it's for sippy cups, clothing, or gear, these little labels stay put, even in the washing machine and dishwasher! Since these labels are customized, give yourself some time to receive them in the mail! Here's a link to a little sale they've got on until the end of the month. Not a subscriber? Sign up and access our back issues here.